Hear the varied perspectives of the Rev. Bryan Fulwider, Rabbi Steve Engel and Imam Muhammad Musri as each week they discuss how faith impacts both the simple and the complex aspects of life. These three clergy come together as friends to discuss topics from the perspective of the different religions they represent. They contend that “good religion works for peace, respects and values others regardless of their religious perspective, and works through acts of compassion to make the world a better place for everyone.” Friends Talking Faith with The Three Wise Guys airs on Tuesdays at 6:30 pm on 90.7 WMFE FM in Orlando. Tune in on your radio or listen online. You can also listen to any show already aired. During October, the Three Wise Guys will talk with Dr. Joel Hunter, for 32 years pastor at Northland Church in Longwood; interview once again a favorite guest, Dr. Barry Kerzin, personal physician to the Dalai Lama; discuss religious liberty, noting how people of faith may understand it differently; and do a show on sexual harassment and sexual predators. October promises to be another month of “must hear” radio. ​On Wednesday, October 4, Shepherd’s Hope broke ground for the new West Orange Medical Clinic and Administrative Center in Winter Garden (445 9th Street, Winter Garden, FL 34787). The new facility will be the the first permanent clinic for Shepherd’s Hope and will provide greater access to free healthcare services for the growing West Orange County community. Shepherd’s Hope, a faith-based nonprofit organization, provides free primary-care and specialty-care medical services to uninsured men, women and children. It has five free-standing health centers in Orange and Seminole counties. In 2016, Shepherd’s Hope provided 17,128 free patient visits and medical services, thanks to partnerships with 2,300 licensed medical and general volunteers, 3 community hospital systems, 100 diagnostic/surgical providers and 23 multi-faith partners. Click here to learn more; or call 407-876-6699. The Rev. Dr. Mae Cannon, minister, writer and academic, will speak at the Fellowship Hall of St. Luke’s United Methodist Church (4851 South Apopka Vineland Road) on Tuesday, October 10, from 6:30 to 8:00 pm, addressing the topic of Holistic Christian Advocacy for Peace in the Middle East. Rev. Dr. Cannon currently serves as the Executive Director of Churches for Middle East Peace in Washington, D.C. She is author of Social Justice Handbook: Small Steps for a Better World and Just Spirituality: How Faith Practices Fuel Social Action. 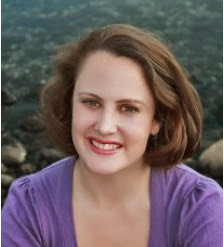 She was co-author of Forgive Us: Confessions of a Compromised Faith. Her presentation will focus on such questions as: What does the Christian faith inform us of advocacy? How can Christians stand for peace while seeking justice for all? What best practices of advocacy can be gleaned from churches for Middle East peace? The program is free, and the public is invited. Discussion: What If There’s Intelligent Life out There? The headline on Newsweek’s website read: “NASA Is Hiring a Planetary Protection Officer to Save Earth from Aliens.” The reality is that the new employee’s job will focus more on potential microbial contamination from returning space missions than with friendly or malevolent life forms from elsewhere. But it does raise an intriguing question—one we’ll discuss at the September 13 Interfaith Discussion. Question: If we found irrefutable evidence of intelligent life from another planet, what would be the impact on your faith? Do you think adherents to your faith would embrace such a discovery? Condemn and combat it? Deny it? Would your faith be concerned that apristine alien life form might be contaminated by Earth’s less-than-perfect people and environment? Or would the concern be that an evil order of beings might pollute us and our world even more than is already the case? Think about those questions and more. Then come to discuss them at the Interfaith Discussion on Wednesday evening, September 13, sponsored by the Interfaith Council of Central Florida. 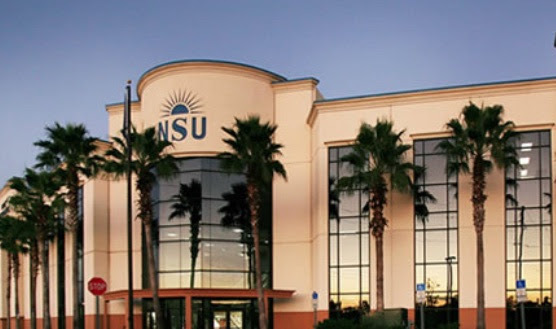 The discussion is held from 7:00 to 8:30 pm on the second Wednesday of each month at Adventist University of Health Sciences (671 Winyah Drive, Orlando, FL 32803) on Florida Hospital’s main campus. The exchanges are respectful, open and candid, and the participants represent a variety of faith traditions as well as those who question the validity of faith altogether. For directions to the meeting place, click here. Admission is free. Everyone is invited. Whether the crisis is happening in Texas (hurricane), Florida (hurricane), Mexico(earthquake), Puerto Rico (hurricane), Bangladesh (exile of the Rohingya Muslims from Myanmar), one common denominator is the presence of Sikhs providing relief for the victims. Sikhs believe that humanity is one family, that all humans have innate value and must be treated with dignity and respect, and the fortunate must always come to the aid of the unfortunate. 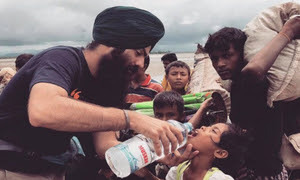 At the local, national and global level, Sikhs are organized to respond in times of need, whether the need is a natural disaster or a personal misfortune. In their assistance, they always work toward the longer-term goal of rehabilitation and self-sufficiency. Sikhism is the world’s fifth largest religion, with a high percentage of the adherents residing in India. It is estimated that the Sikh population in the United States may be around half a million, with a similar number living in Canada (1.4 percent of the Canadian population). Harbor House—Orange County’s only 24/7 certified domestic-violence organization that provides free services in the time of greatest need—will host its annual Purple Door Luncheon as a major event during domestic violence awareness month. This year’s Purple Door Luncheon will be on Wednesday, October 18, at Rosen Centre Hotel (9840 International Dr. Orlando, FL 32819). There will be networking from 11:00 am until noon. The luncheon and program, which will run from 12:00 noon to 1:00 pm, will include a special awards presentation for champions working to end violence both in our community and on a national level. Monies raised by the event will support Harbor House’s mission to stop the cycle of domestic violence. Click here for more detail and to buy tickets or sponsor tables. Registration closes at noon on Tuesday, October 17. Harbor House began in 1976 as an unassuming home with a very special door. A single knock could save a life because when the door opened, someone seeking a safe-haven indeed found safety. That was the beginning of Harbor House. Since then Harbor House has opened its “door” countless times to women, young children, teens and seniors, offering a fresh start to a life free of abuse and fear. October is Domestic Violence Awareness Month. Are you concerned about homelessness in Central Florida? Want to get more involved in doing something about it? Do you enjoy inspirational movies? Like to watch the acting of Greg Kinnear and Renee Zellweger? Relish a bargain? 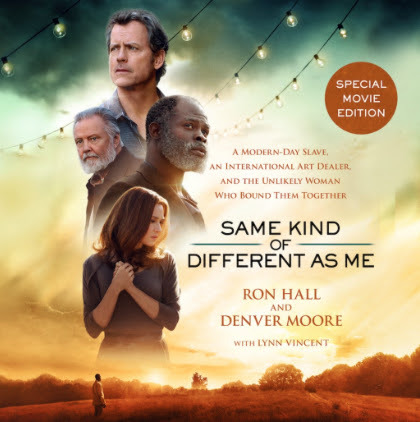 Then why not achieve all of the above by attending a pre-release screening of the film Same Kind of Different as Me, which is being sponsored by the Orlando Rescue Mission. In fact, why not get your work associates, family members, neighbors, faith group or any others to join you for the one-time special offer to see this life-changing feature film about homelessness, compassion and human transformation. Same Kind of Different as Me will be shown on Wednesday, October 18, at the Winter Park Village and Waterford Lakes theater complexes. Click here for times and to order your $10 tickets. The video on the foregoing site features comments about the film from local faith leaders Dr. Joel Hunter, Bishop Kelvin Cobaris, Pastor Danny de Armas, and Stephanie de Oliveira (of Calvario City Church). Click here to see a clip of the actors and director discussing the movie. From Pew Research Center: “More than 80 countries favor a specific religion, either as an official, government-endorsed religion or by affording one religion preferential treatment over other faiths, according to a new Pew Research Center analysis of data covering 199 countries and territories around the world. . . . Islam is the most common government-endorsed faith, with 27 countries (including most in the Middle East-North Africa region) officially enshrining Islam as their state religion. By comparison, just 13 countries (including nine European nations) designate Christianity or a particular Christian denomination as their state religion. . . . But an additional 40 governments around the globe unofficially favor a particular religion, and in most cases the preferred faith is a branch of Christianity. Indeed, Christian churches receive preferential treatment in more countries – 28 – than any other unofficial but favored faith.” Click here for more detail. The Peace Institute (1021 North Goldenrod Road, Orlando, FL 32807) and Nova Southeastern University Orlando are joining forces to bring to the public “a day of intriguing discussions and dialogue about the issues that matter in our community and schools.” The event, which will be held from 1:00 to 4:00 pmat Nova Southeastern University Orlando (4850 Millenia Blvd., Orlando, FL 32839). Interfaith leaders and social-engagement advocates will discuss some of the major social issues affecting our communities—gun violence, drug abuse, mass incarceration. Who should attend? Juniors and seniors in high school, college students, safety coordinators, teachers, school administrators, peace advocates, all who care deeply about liberty and justice for all. Click here for a thought-provoking video clip. Admission is free, lunch is free, and free school supplies will be given to the first 50 guests who register and arrive by 12:30 pm. Don’t miss this opportunity to “be the change you want to see” in the community. The event is part of the Peace Institute’s United We Stand for Peace initiative. Click here for more information and to register. Do journalists have a responsibility to report the truth? Who decides what news is factual or what is “fake news”? And do we have an obligation to be responsible consumers by vetting news sources? These questions and more will be addressed by a panel at the Orange County Regional History Center on Tuesday, October 24, at 6:00 pm. Sara Brady, a crisis communications and strategic public relations expert, will moderate the panel, which will include Terri Day, professor at Barry University’s Law School; Beth Kassab, columnist at the Orlando Sentinel; Catherine Welch, News Director at WMFE; and Lauren Bowes, Digital PR & Marketing Manager at Findsome & Winmore, as they explore the obligations journalists have in the ethical investigation and reporting of the news. Seating is limited, and tickets are required to reserve your space. If you have any questions or need assistance, please either phone the Holocaust Center at 407-628-0555 or email Terrance Hunter. The panel discussion is coordinated by the Holocaust Center (851 North Maitland Avenue, Maitland FL 32751). Learn more about their innovative and thought-provoking exhibits and programming at their website and on Facebook. Making healthy choices is far easier said than done—at least according to Sam Kass, speaker for Florida Hospital’s October 25 Distinguished Lecture Series presentation, which will be held at the Orlando Museum of Art (2416 North Mills Avenue, Orlando, FL 32803). 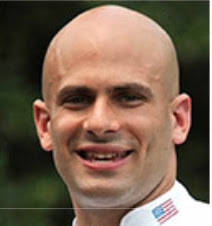 And Sam Kass should know, having served as Executive Director of former First Lady Michelle Obama’s “Let’s Move!” campaign. Kass garnered acclaim for his leadership at the forefront of the First Lady’s national, multifaceted initiative to encourage healthful eating and exercise for all Americans, especially our children. In his October 25 presentation Kass will explore the impact that sustainability, wellness and healthcare policies have on our communities. In addition to heading up “Let’s Move!” Kass served as personal chef to the Obama family, served as White Adviser on Nutrition Policy, and helped the First Lady create the first major vegetable garden at the White House since Eleanor Roosevelt’s victory garden. (To date the garden has yielded thousands of pounds of produce that has been used to feed event guests, staff and the First Family at the White House, with further harvests donated to local food shelters.) Registration and hors d’oeuvres begin at 5:30 pm, with the presentation running from 6:30 to 7:30 pm. Click here for more information and to register. The presentation is free and the public is invited. Email questions to Florida Hospital Distinguished Lecture Series. The Atlantic Institute is inviting the public to a lecture by Sevgi Akarcesme, a Turkish journalist in exile, to be held at the Istanbul Cultural Center (940 South Winter Park Drive, Casselberry, FL 32707) on Thursday, November 2, at 6:30 pm. Ms. Akarçeşme will discuss Turkey’s swift drift into dictatorship, not only telling about her own ordeal but also analyzing the current political and social climate in Turkey as a massive purge continues. She was dismissed as editor-in-chief of Today’s Zaman, an English daily in Turkey, which was brutally taken over by the regime in 2016. 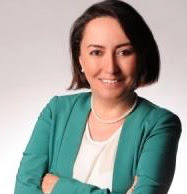 Ms. Akarçeşme received her BA degree in Political Science from Bilkent University in Turkey in 2001. She holds Masters degrees in International Relations and Political Science from Temple University. Following her graduate studies, she joined CSIS (Center for Strategic and International Studies) in Washington, D.C. In Turkey, she worked at the Office of the President between 2008 and 2011. The November 2 event, which is part of the Atlantic Institute’s Lecture Series, will begin at 6:00 pm with a reception and light refreshments, followed by the presentation at 6:30 and a Q&A at 7:30. Space is limited, and those wishing to attend must RSVP to Dr. Debbie Medina by October 27. Multi-Faith Workshop: Can Collective Prayer Impact Peace? The New Age (Seniors) Group of the Hindu Society of Central Florida (1994 East Lake Drive, Casselberry, FL 32707)) cordially invites the public to a Multi-Faith Workshop on Sunday, November 5, from 2:00 to 3:30 pm (followed by refreshments). Theme for the day is: “The Importance of Collective Prayer in Promoting Global Peace.” The presenters, representing several faith traditions, will give brief presentations focusing on the role of both personal and collective prayer in fostering peace for the individual, the community and the world, based on their faith tradition’s teachings. Are there steps we can take as individuals, following the practices and values of our respective faith traditions, to plant the seeds of peace and to nurture peace to fruition? Is global peace something we can actually impact through both private and collective prayer? What does your faith tradition teach? What does your faith community do to encourage adherents to become involved in collective intra-faith prayer for peace? What do the faith traditions do to encourage inter-faith collective prayer for peace? These questions and more will be addressed. The event is a collaborative effort of Hindu University of America, the Chinmaya Mission, the Sikh Society of Central Florida and the Interfaith Council of Central Florida. The event is free, with prior email RSVP, and the public is invited. The annual Florida Faith Symposium will be held November 7-8 at the Rosen Centre Hotel (9840 International Drive, Orlando, FL, 32819). The Symposium is one of the State of Florida’s premier events to bring together leaders of faith—who are almost exclusively Christian, as are the emphases and vocabulary of the faith components of the programming—child welfare, juvenile justice and others to talk about how we can more effectively work together to empower Florida’s children and families and set them on a path to success. The event is being held in collaboration with the Florida Department of Juvenile Justice, the Florida Department of Children and Families and their partner, the Florida Faith-Based and Community-Based Advisory Council. Go to the Faith Symposium website for more information, costs and to register.